PASADENA--Hundreds of people gathered outside the Pasadena branch of the LA Superior Court yesterday--by some estimates as many as a thousand--to show their support for the victim of this legal lynching. The spirited crowd chanted, sang, danced, and held signs and banners, but also paused to listen to speakers during the two press conferences, one held prior to the hearing and the other held after the sentence was conferred. While one of the crowd's chants called for authorities to "Free Jasmine Right Now!," the concrete demand made by the leadership was for the judge to not sentence Jasmine to any jail time. The activist community considers her a political prisoner who had been profiled, surveilled, harassed, and ultimately entrapped by police and maliciously prosecuted by the district attorney's office. Given that perspective, the sentence, which consisted of a 90-day jail term, three years' probation, and a year of anger management, was considered unjust. 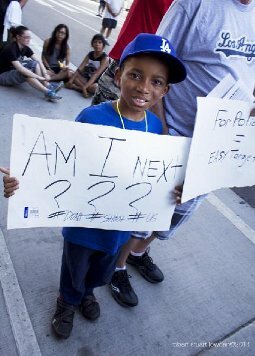 As part of a vast national response in 37 cities to The Ferguson, Missouri shooting of 18 year old Michael Brown, Los Angeles saw two protests over two days. Citing LA's own tragic losses and police abuse of Ezell Ford, Omar Abrego, Damon Jackson and Barry Montgomery the streets hosted two wildcat marches. The first was on Sunday August 17th outside of LAPD Headquarters and the second was the following day in front of both the Ford family home and the Abrego family home in South Central Los Angeles. The story of police abuse is being seen by most as a a black male issue but these crowds gave pause to that notion. The protesters were a very mixed crowd both racially and culturally. There were families of the slain and abused men holding large photos of their brothers, fathers and sons. Three of the deceased men were challenged mentally. Two of them Ezell Ford and Damon Jackson were killed by Los Angeles police while a young schizophrenic named Barry Montgomery was beaten and hidden inside the Los Angeles jail system for days while his family searched for him frantically. The police response was very light. There were bike cops and motorcycle police along with a fair amount of regular LAPD at the first action. Some streets were roped off while others streets were quickly blocked to traffic as the crowd sporadically wound it's way wildcat style through downtown. The response was essentially the opposite of the Ferguson display of force.